Discovery - Discovering what your goals are and refining your targeted keywords. Create a baseline – Look at your current website and your competitors to create a baseline for moving forward. Optimization & Marketing - Make our suggestions for optimizing your website and other marketing avenues. Content Strategy & Social Media – Create a content strategy and encourage social media. Implement & Analyze – Implement strategies and analyze progress. Get the right kind of traffic. 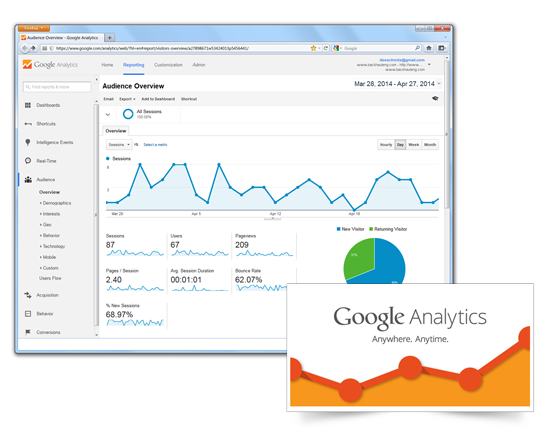 Analyzing your traffic is essential to adjusting your marketing efforts. Additional steps to drive traffic to your site would involve setting up a blog, utilizing social networks (Facebook, Twitter, LinkedIn, Instagram, etc.) and Pay-Per-Click Advertising. Social Media participation creates content in the form of comments, reviews and media being shared. This additionally will provide more information for search engines to crawl, index and rank.